Long a favorite over Radio and in Film, Joan Davis had generally played second banana to other leading comedians. It was Lever Bros. and Swan Soap that elevated Joan Davis to 'star' quality with its 1945, record-breaking $1,000,000 contract for her services--making Joan Davis the highest paid comic in history up to that point. 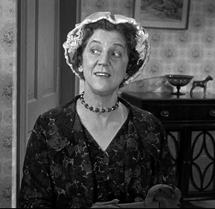 By 1945, Joan Davis had already appeared in over 40 films and comedy shorts. As pointed out by LIFE magazine in their October 1st, 1945 article: "Her rise to these remarkable financial heights started four years ago when she got a job as a comic with Rudy Vallee and John Barrymore on the Sealtest hour. When Barrymore died and Vallee enlisted in the Coast Guard, skeptics thought the Sealtest program was finished. 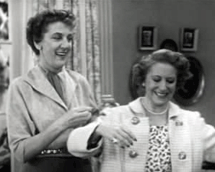 To their surprise, Joan Davis' wacky comedy not only carried the program by itself, but shot popularity skyward." Given her rising popularity, Swan Soap may well have thought that their $1M investment in Joan Davis was entirely warranted. 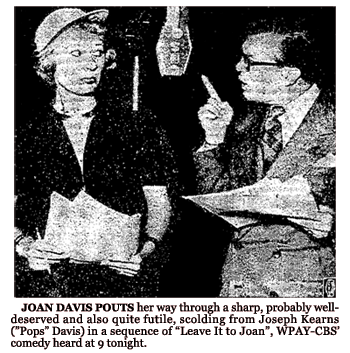 Capitalizing on both Joan Davis' popularity and Swan Soap's own 'Swanny' the Goose cartoon character, Swan Soap aggressively promoted The Joan Davis Show thoughout its 39-episode run over Radio. 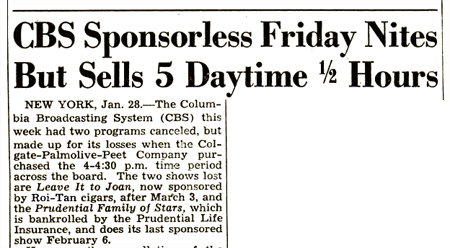 CBS picked Joan Davis up again in 1947 for its network-sustained Joan Davis Time for another thirty-eight episodes during 1947 and 1948. 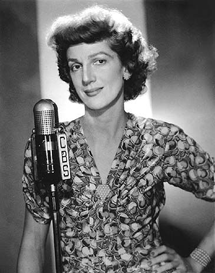 After a second hiatus over CBS, Joan Davis launched her last starring Radio series, Leave It to Joan, as a Summer replacement for Lux Radio Theater during 1949. 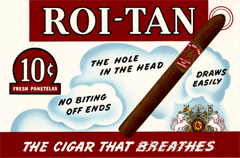 CBS and American Tobacco's Roi-Tan Cigars picked up Leave It to Joan for the Fall Season of 1949. 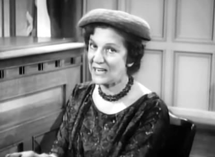 During Joan Davis' first two outings in starring roles over Radio, Joan Davis appeared as "Joanie", the owner of 'Joanie's Tea Room,' in perhaps an homage to the wildly popular, long-running Duffy's Tavern (1941-1952). 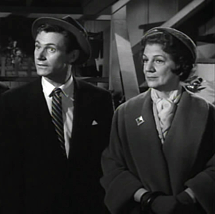 By Leave It to Joan, Joan Davis transitioned to the role of a salesgirl for the fictional Willock's Department store, in yet another homage to Southern California's Bullock's Department Store chain. She was named Madonna, of all things, and at the age of seven was billed as the "Toy Comedienne." Since then, Madonna Josephine Davis has dropped her dignified name, but not her dignity For the audience, her specialty is making herself look ridiculous--as awkward as each of us sometimes fears we must look to other people. But you have to be a very self-assured person to be able to spend your life appearing as a bundle of misplaced arms and legs with a collection of unworldly facial contortions and uninhibited actions. The Joan Davis that you never see is a poised, attractive woman, serious-minded, an avid reader, and a hard worker. At the age of three, she sang and recited pieces at church entertainments, retired for a while until she was six, and since then has risen from the Toy Comedienne to the "Queen of Comedy." Joan married Si Wills, her vaudeville partner in 1931. Pretty soon Si was writing her scripts. In 1936, Joan had a part in a movie called "Millions in the Air" and clowned like no woman had ever clowned before. She bounced and split through dozens of movies after that, and in 1941 she appeared on the Rudy Vallee radio program. Came a parody of "Hey Daddy," and became a regular member of the cast. Since then, she's been splitting sides between movies and radio, but in private life she maintains all the dignily that Joan says a woman should have. One of the best-dressed women in Hollywood, Joan is also the mother of 17-year-old Beverly Wills. Father Si Wills and Joan were divorced in 1947. Beverly, whose main ambition is to be like her mother, now plays the role of Fluffy Adams on radio's "Junior Miss." She's been living in an atmosphere of theatrical chatter all her life, The day she came home with her first report card she announced excitedly, "Look, Mother, did you see the swell write-up' I got." They live together in a small home in Hollywood. Joan is now reigning over Willock's Department store on Leave it To Joan every Friday night. The customers suffer, but they'll never know what Mr. Hackady, the manager, has to endure. Madonna, not the customer, is always right. 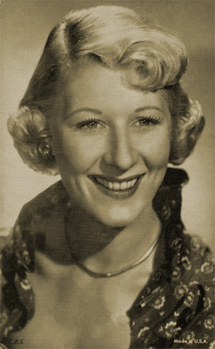 Joan Davis was supported by Radio legends, Joseph Kearns (as Police Sergeant 'Pops' Davis), Willard Waterman (as store manager, Mr. Simon Hackaday), Elvia Allman, Sara Berner, Bob Jellison, and Lou Merrill. Not stinting on music direction, Lud Gluskin, then Lyn Murray, provided the series' scoring. 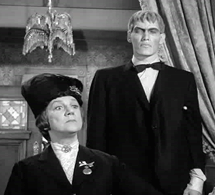 Leave It to Joan also continued CBS' tradition of frequent guest appearances by other CBS stars in its annual line-ups. Musical Theme(s): "Leave It to Joan, Leave It to Joan"
7 p.m.--Leave it to Joan (WBBM): new comedy show starring Joan Davis. 7 p.m.--Joan Davis (WBBM): muddles through to store's exchange department. 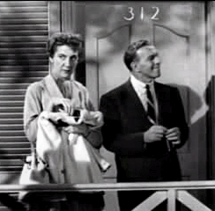 7 p.m.--Leave It to Joan (WBBM): two robbers encounter Miss Davis. 7 p.m.--Leave It to Joan (WBBM): the Davis gal tries to snare an author. 7 p.m.--Leave It to Joan (WBBM): Miss Davis becomes a one-woman marriage bureau. 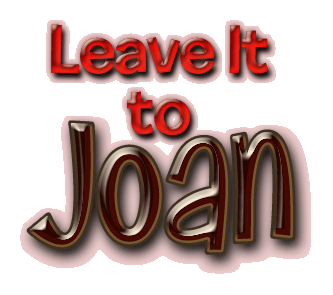 WJR--Leave it to Joan - 9 p.m.
LEAVE IT TO JOAN: Dept. store drama, with Joan Davis; WEEI, 9. The high school football games are being broadcast without interruption, through the courtesy of sponsors of the "Leave It to Joan" show. " Scheduled for Friday night on the CBS network, the show is set for 8 p.m. Wednesday as a delayed broadcast, on WPAY. 6:00KNXWith a big parade in the offing Willock's department store builds a surprise float and Mr. Hackaday swears his staff to secrecy ... but ... "Leave It to Joan" .. . she spills the information to the rival store detective. JOAN DAVIS STARS IN THE NEW SITUATION COMedy show, "Leave It to Joan," which tells of a day-dreaming store salesgirl and her hilarious travails. The program is a Friday night feature on the CBS network. KTSA8 P.M.
THAT "ONE WOMAN MIRTHQUAKE," JOAN DAVIS, will have you rolling off your chair again tonight at 8 -p.m.
Joan Davis, star of "Leave it to Joan," is a salesgirl in a department store who mixes DAYDREAMS with SALESTALK. KTSA. Joan Davis, KTSA, 8 p.m., tangles with Art Linkletter in what promises to be a hilarious half-hour program. 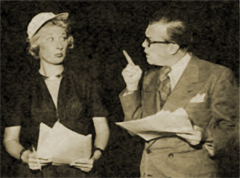 Garry Moore, KTSA, 8 p.m.,' invades the department store to provide a hilarious comedy sequence for Joan Davis. New shows for tonight: CBS 9 Up for Parole, stories of prison case bistories. replacement for the departed Joan Davis Comedy. 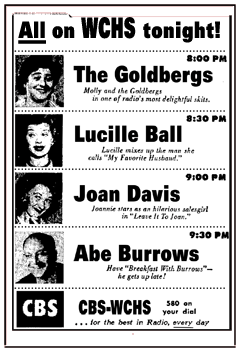 8 p.m.--Leave It to Joan (WBBM): Miss Davis returns to the air. 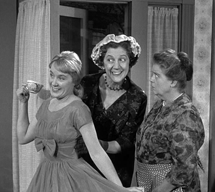 Leave It To Joan, KTSA, 9 p.m.-Joan Davis as a zany salesgirl in this comedy program. 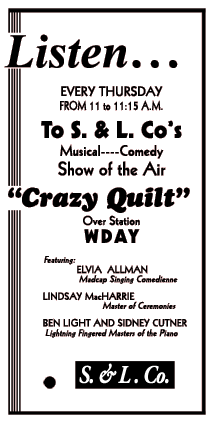 Leave It to Joan, KTSA, 9 p.m.Presents the scatterbrained Joan Davis as a sales girl of sorts. Birthplace: St. Paul, Minnesota, U.S.A. FINAL CURTAIN: Comedienne Joan Davis, 53, one-time runner-up to Bob Hope and Jack Benny as the highest paid radio star, died today of a heart attack at Desert Hospital, Palm Springs, Calif. The noisy, grimacing actress was admitted to the hospital late Monday. With her when she died early today were her mother and a Roman Catholic priest. Miss Davis was born June 29, 1907, at St. Paul, Minn., to train dispatcher Leroy Davis and his wife, Nina. While best known in radio, the actress, who frequently portrayed the ungainly, frustrated female type, appeared in many motion, pictures, including "George White's Scandals," and "Love and Hisses." She entered pictures in 1934 as a hillbilly in a Mack Sennett short subject, "Way Up Thar." 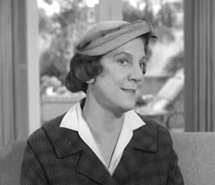 She easily made the transition to television, starring in the "I Married Joan" series with Jim Backus. 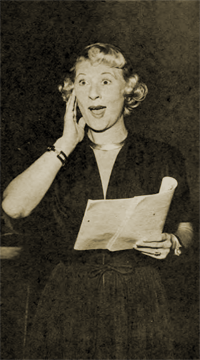 After a long career in vaudeville, Miss Davis satirized the song, "My Jim," on a Rudy Vallee program to win her first nationwide attention. 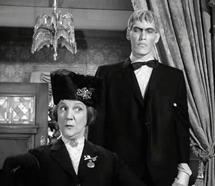 She appeared in an Abbott and Costello picture "Hold That Ghost," then became the highest paid woman on the radio with a network contract at $1 million a year. She married her vaudeville partner, Si Wills, in 1931 and their daughter, Beverly, later appeared with her in the television series. 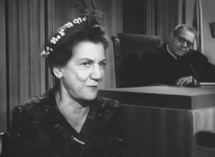 Miss Davis divorced Wills in 1947.